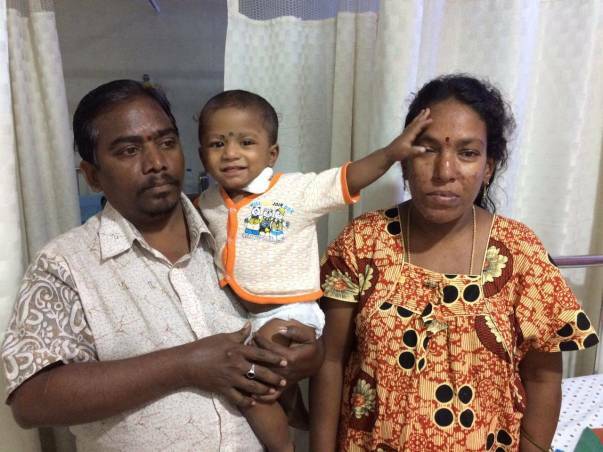 Siva Sai Likitesh is a 1 year old male child of Mr. Girish Babu and Mrs. Dhanalakshmi, residing at Usman Saipet, Nellore, Andhra Pradesh. The baby is diagnosed to have Hepatoblastoma and underwent six cycles of chemotherapy. He had a very good response to chemotherapy and there was considerable shrinkage of tumor. 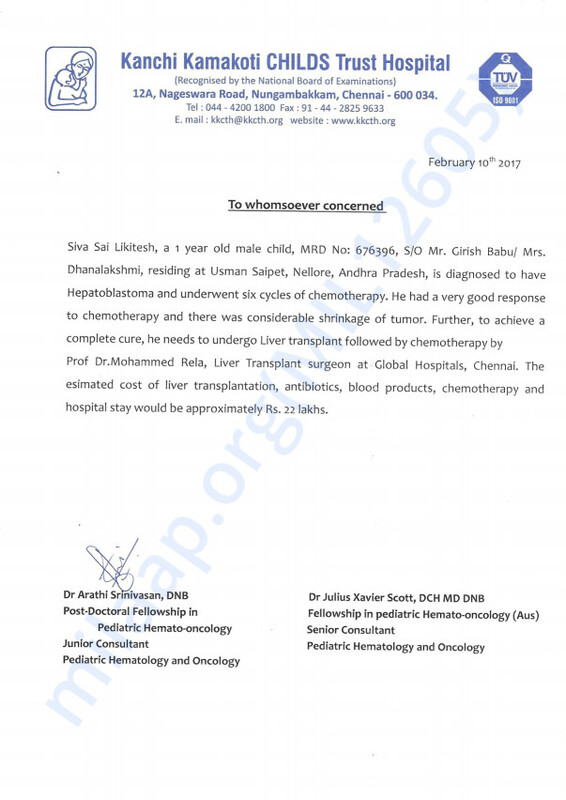 Further, to achieve a complete cure, he needs to undergo Liver transplant followed by chemotherapy by Prof Dr.Mohammed Rela, Liver Transplant surgeon at Global Hospitals, Chennai. The esimated cost of liver transplantation, antibiotics, blood products, chemotherapy and hospital stay would be approximately Rs. 22 lakhs. 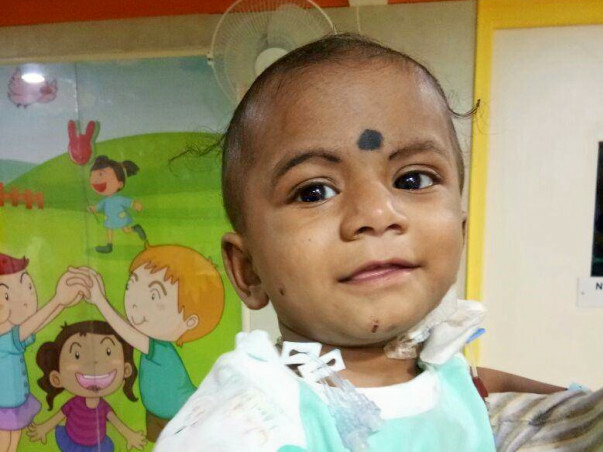 As for Sai Likitesh, he continues to grow rapidly, playing energetically with the other kids at the Kanchi Kamakoti Children's Trust Hospital, Chennai. Even when he needs to lie down for intravenous treatment, he no longer screams and cries. His parents' quiet, steady presence comforts him. When he was 8-months-old, Sai was brought to the hospital for chronic diarrhoea and fever. The doctor recommended a scan that revealed the cancer developing in little Sai's liver. The tumour needed to be shrunk with chemotherapy. Following that, Sai needs a liver transplant for complete recovery. So far, Girish has spent over 3 lakhs on Sai's treatment. But he does not have enough funds for the transplant that will save Sai's life. Siva Sai Likitesh underwent his liver transplantation. Teh surgery was performed by Dr. Rela at Global Hospitals, Chennai. 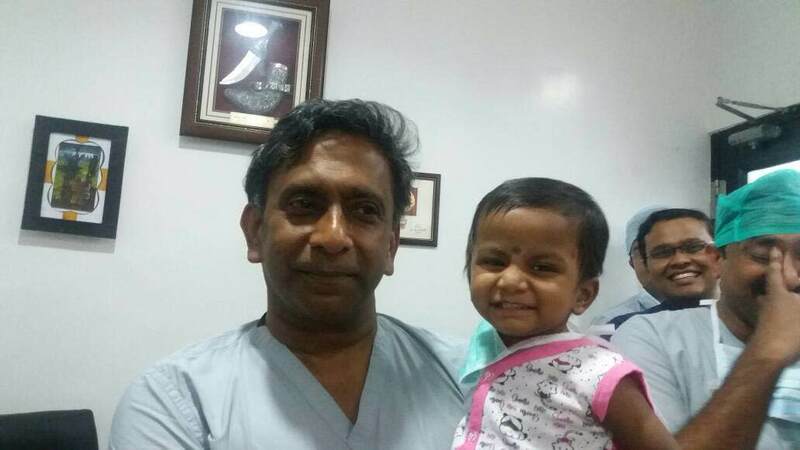 Here is a photo of the baby with Dr. Rela. Thanks for the overwhelming support. Siva sai is discharged and he went home happily. He will be back with us next week for another cycle of chemotherapy. He is doing very well on chemotherapy. Thanks for all your support towards Sai Likitesh. Good news is that he has been tolerating his chemotherapy very well. He just completed a cycle a chemotherapy. He is cheerful and playful. He will be able to go home and get back for the next treatment in a few days.